Colorado’s recent vote to move part of the hemp definition out of the state constitution has some entrepreneurs cheering, while others warn it could lead to federal meddling in the nation’s largest hemp market. Amendment X left the overall definition of hemp in Colorado’s constitution but removed the THC limit of 0.3%. The change allows Colorado lawmakers – or Congress – to recalibrate hemp’s THC limit without voter approval. Supporters of Amendment X successfully argued that Colorado’s constitutional THC limit would stymie hemp farmers, processors and retailers if Congress ever raises the federal THC threshold from 0.3%. The measure passed with more than 60% of the vote. “Having the definition of hemp set in stone by the state’s constitution is inflexible,” said Jon Vaught, CEO of Front Range Biosciences, a cannabis biotech firm in Lafayette, Colorado. “If the federal government amended the threshold to 0.5% or 0.7%, Colorado would have to wait until the next election,” he wrote in an email to Hemp Industry Daily. The national hemp industry is paying attention. That’s because Colorado had more acres in hemp than any other state in 2017 (2018 crop totals aren’t yet available in many states). 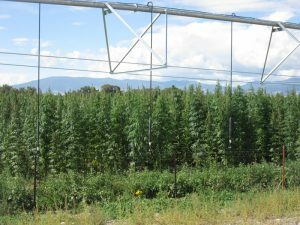 National hemp advocates believe hemp’s growing popularity means Congress may be inclined to elevate hemp’s THC maximum, a move many hemp farmers say could prevent them from having to destroy crops that test “hot,” or above 0.3% THC. Congress could just as easily lower the THC limit on hemp. Politicians should not be trusted to control the definition of hemp. “Removing (the THC limit) from the (state) constitution and putting it in the hands of Congress and lobbyists is not rational,” said Veronica Carpio, who has been growing hemp in Colorado since 2013, a year before the 2014 Farm Bill authorized states to produce hemp. Carpio said the change puts Colorado’s hemp industry at risk because it assumes the state would follow whatever THC standard Congress prefers. Other hemp businesses say it’s a safe bet that growing national support for hemp expansion means Colorado faces nothing but upside from taking hemp’s THC limit out of the state constitution. “It’s a tool that will only benefit our industry,” said Morris Beegle, owner of Loveland-based Colorado Hemp Co., which makes hemp paper and other products. Great article. Thanks for covering this story. I would like to address the WV at 1% mention. It is a bit confusing but WV did pass law to allow for 1% thc on hemp if the feds did raise but they are only allowing 0.3% thc to pass for state tests. So they did prove an allowance in their law for high thc if feds raised but have everything at 0.3% thc currently to stay in complaince with federal farm bill. There is no any state who allows for over 0.3% thc in their hemp programs. I think that allowing THC levels greater than 0.3% will expose many consumers to resellers that don’t care if the user were to fail a drug test and lose a job. We always use raw CBD from government authorized hemp farms and we take great care to educate our customers on what they are purchasing. Without some regulation we will continue to see products that have 0% CBD and 20% THC. It will take a few years to shake out the pretenders and it will be a very fast few years. CBD hemp is not industrial hemp. The lumping of the reduced THC cannabis with true industrial hemp is a fiasco. There is a substantial difference.